The Radhastami celebrations begin with Mangala Aarti of Sri-Sri Radha Madhava, the most Attractive Couple of the City beautiful at 4:30 am followed by Tulsi Aarti, Prabhat pheri, Guru-puja of His Divine Grace A.C. Bhaktivedanta Swami Prabhupada, the founder acharya of the International Society for Krishna Consciousness. Chanting of the Holy names of Krishna with melodious tunes enthralled hundreds of devotees present. The main attraction of the festival is Charan Darshan of Srimati Radharani. 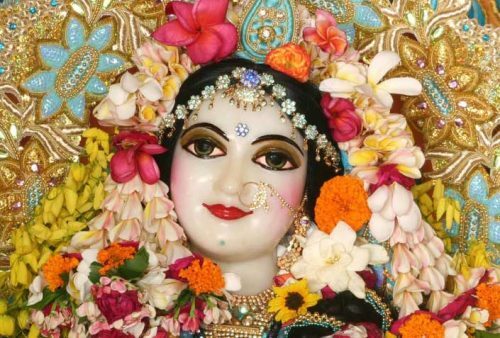 This is the only day in the whole year on which Charan Darshan of Radharani is available. On this auspicious occasion the Deities of Sri Radha Madhava are adorned with a new dress. The altar is decorated with brilliant, colourful flowers which spread their fragrance everywhere. In the noon, the utsava Deities of Sri Radha Madhava receive a splendid abhisheka. Devotees perform kirtanas and glorify Srimati Radharani by singing wonderful songs composed by Vaishnava Acharyas. Hundreds of devotees visit the temple to witness the celebrations. The Deities are bathed with milk, curd, ghee, honey and jaggery water followed by juices from varieties of fruits like muskmelon, apple, pineapple, pomegranate, orange, sweet lime, papaya, grapes, etc. An elaborate arati is performed as the devotees sing Sri Radhikastava. After the arati, the Deities are bathed with sanctified water from 108 Tirthas. This is followed by the showering of different varieties of flower petals. After the abhisheka, chappan bhog (56 varieties of delicacies prepared by devotees) is offered to Sri Radha Madhava. A special Boat festival of Sri Sri Radha Madhava is the main attraction of the festival in evening. In the temple courtyard in a special water pond with the help of a small boat well decorated with fragrant flowers. Water was sprinkled with rose petals. Hundreds of devotees were chanting & dancing when Their Lordships Sri Sri Radha Madhava were being carried in the boat. The programme concluded with distribution of Prasadam.